North Korea’s Supreme Leader Kim Jong-Un has seemingly morphed from a howling fang-baring wolf into an eager-to-please puppy dog in just a few short months. The US President is puffing-up his chest for bringing “Rocket Man” to heel. But scratch beneath the surface, look beyond the rosy optics, and the complexities of achieving a nuclear-free Korean Peninsula are immense, writes Linda S. Heard. Donald Trump’s devoted rah-rah crowds believe their idol deserves a Nobel Peace Prize for his bellicose “fire and fury” tweets and economic sanctions, which they believe are responsible for dragging Mr. Kim to the peace table. Certainly, the North Korean leadership has been further isolated and squeezed economically but without Beijing’s willingness to comply with crippling UN sanctions imposed on Pyongyang, suspending coal imports and limiting exports of crude and refined petroleum, North Korea would not have felt the pinch. I would argue that if there is any prize forthcoming it should go to the leaders of the two Koreas, who laid the groundwork for détente in the weeks prior to the Pyeongchang Winter Olympics in which North Korean athletes participated watched by high North Korean officials as well as Kim Jong-Un’s photogenic younger sister. It is worth recalling that Trump was irritated by the efforts of South Korea’s President Moon Jae-in to reach out to his North Korean counterpart. “South Korea is finding, as I have told them, that their talk of appeasement with North Korea will not work, they only understand one thing!” he tweeted. Moreover, he threatened to pull the US out of a bilateral Free Trade Agreement with South Korea. That tentative Olympic diplomacy culminated in an historic meeting between the two leaders held at the Demilitarised Zone’s Peace House. They greeted one another like brothers. Smiles, hand-holding and hugs were in abundance. Kim was invited to step across the demarcation line onto the soil of a hitherto enemy nation upon which no North Korean leader had stood for 64 years when an armistice agreement was signed to silence the guns on a nation divided. But without a peace treaty a technical state of war prevailed separating family members and heightening tensions. There is many a slip between cup and lip, but it was evident by the Penmunjeom declaration signed by both men, that they sincerely welcome a new era of national reconciliation, peace and prosperity with a view to unifying as one Korean nation in a completely denuclearized peninsula. So far so good, but realistically-speaking, persuading Kim Jong-Un to relinquish his pride and joy, his nuclear deterrent, is a whole different kettle of fish. Yes, he says he is ready to negotiate with Mr. Trump without preconditions. Yes, he says his nuclear capability will be on the table and to show goodwill he has pledged to close his nuclear test site. Yes he has reportedly revealed to his South Korean counterpart that he is prepared to abandon his nuclear programme on condition the US pledges to officially end the Korean War and promises not to invade. Furthermore, he is ready to meet with Japan’s Prime Minister Shinzo Abe, who until now has been highly sceptical about a climate that has gone from freezing to sunny almost overnight. Kim’s avowals sound almost too good to be true, especially coming from a dictator not averse to assassinating members of his own family and starving his people, who just a few months ago was launching missiles over Japan and threatening to nuke Guam – and that is because it probably is. Time will be the ultimate arbiter. Trump has agreed to meet face to face with the North Korean leader, something no previous American President has contemplated. These two mercurial characters will get together as the representatives of nuclear powers. Both hold meaningful bargaining chips. 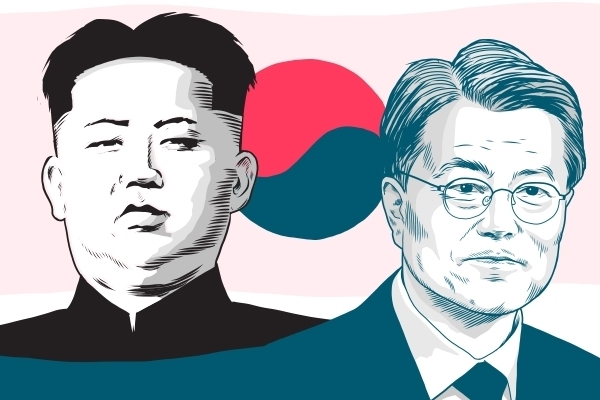 Whichever way the negotiations go, Mr. Kim will have gained prestige as an important player on the world’s stage. Trump warns that if talks don’t go his way, he will walk. When it comes to the nitty-gritty, Kim’s newly adopted puppy personality could well revert to its usual wolfish tone. To imagine he would leave himself and his dynasty vulnerable to the whims of an American President would be foolish. American administrations have went back on their written commitments before. The mainstream media likes to paint North Korea as the party that reneged on the 1994 Clinton deal brokered by former President Jimmy Carter whose intervention prevented a major brewing conflict. Kim Il-Sung was described by Carter as “a vigorous and intelligent” man. A deal was struck whereby the then Dear Leader pledged to disband his nuclear weapons facilities in return for US$ 5 bn financial aid, 500,000 tons of oil supplies annually, food and two light-water proliferation-resistant nuclear reactors. When those incentives failed to manifest, Pyongyang accused the Clinton administration of negating its agreement and renewed construction of missile launch pads and storage bunkers. Enter George W. Bush who placed North Korea as a handy addition to his Axis of Evil and the rest is history. Let’s be honest, Mr. Trump does not have the diplomatic finesse of President Carter. The fear is he will charge in like a bull in a china shop, thus upping the potential for war once again. Without a modicum of trust there will be no deal this time around. Moreover, Trump’s record of sticking to deals is abysmal. In less than 18 months he has pulled out of the Trans-Pacific Partnership (TPP), threatens to withdraw from NAFTA, taken the US out of the Paris Climate Accord – and may be poised to tear-up the Iran nuclear agreement. Standing in Kim’s shoes for a moment, he would be mad to kiss goodbye to his deterrent in light of what happened to Saddam Hussein known to have destroyed his nuclear, chemical and biological weapons in 1991 and, more recently, Muammar Qaddafi who renounced weapons of mass destruction in 2003 only to be rewarded with assassination. It is my opinion that the North Korean leader is going through the motions until he can get cast iron guarantees regarding the longevity of his rule and the integrity of his state. He is talking a good talk and being seen internationally in a positive light. He will certainly not believe anything that comes out of President Trump’s mouth, a man who changes his mind on a dime and has surrounded himself with neoconservative war hawks. The only country that may be able to provide the reassurances he needs is China, a country that so far has been kept out of the loop. Relations between Pyongyang and Beijing have cooled recently. China sees North Korea as a powerful buffer between it and the 24,000 US military personnel stationed in the South, not to mention a massive array of US missiles and tanks. With China on board ready to accept North Korea under its nuclear umbrella and concessions from the US to end military exercises and reduce its military footprint, Korea’s reunification in a nuclear-free peninsula could become a reality over time but I won’t hold my breath.